Our mission is to fulfill our call to be the physical presence of Jesus Christ by worshipping God with passion, intentionally growing in faith, proclaiming the gospel with grace, and humbly serving in love. We have 7 services at 3 locations, but we are one body. 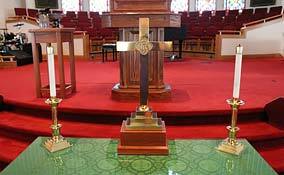 Weddington UMC has three different styles of worship that range from modern to traditional. Child care is provided during the services. It is important for the church to come together to worship God with praise. We are very proud of our music ministry team! The most recent Sunday morning sermons are available online as well as on our Apple podcast and Weddington Church mobile app. Please click here to fill out a sermon CD/DVD request form. We offer a variety of opportunities for learning, fellowship, and discipleship.